The Debt Diet - Pay down debt, reduce stress, and improve well-being. A comprehensive, stage matched online program developed in collaboration with national financial expert Jean Chatzky that helps individuals to find $10 a day to put toward paying down debt or building an emergency fund. Eight out of every 10 Americans who participated in a recent poll by the American Psychological Association reported that the economy is a significant cause of stress. And it’s no wonder given the reality of many employees’ day-to-day lives. This financial stress negatively impacts employees’ emotional and physical health–as well as their workplace productivity. Reducing debt can decrease stress, as well as improve health and well-being. 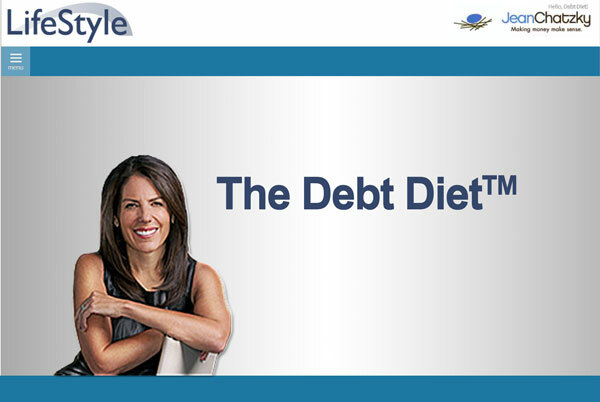 The Debt Diet, a dynamic and innovative mobile-optimized online program, was developed collaboratively by Jean Chatzky, a trusted financial author and advisor, and Pro-Change Behavior Systems, Inc., the leading experts in developing award-winning, evidence based programs based on the Transtheoretical Model (TTM). The Debt Diet combines Jean’s actionable and sound financial advice with time-tested, theoretically grounded, behavior change strategies. TTM starts with a basic premise–change is a process, not an event. This process contains distinct stages of readiness, and leverages targeted approaches to help move people forward through each stage. Essential to the success and broad applicability of the Debt Diet is that it is customized to the needs and mindsets of each employee. The program can help all employees–regardless of how ready they are to change their spending and saving behavior. The program’s interactive exercises are matched to each employee’s needs and readiness to change. The activities clearly demonstrate how decreasing spending by $10 a day can make a significant, lasting difference and offer numerous, practical options for employees to achieve this goal. Users’ experience begins with a brief assessment that determines their readiness to pay down their debt or build an emergency cushion. Based on this assessment, users fall into one of the following categories: Not Ready, Getting Ready, Ready, Taking Action, and Staying With It. A sixth category is for employees with no debt beyond their mortgage who need to save. Users then view relevant video and text-based feedback before being presented with a menu of activities matched to their needs. Users are periodically automatically prompted to re-assess their readiness to set aside $10 a day and are given feedback on their progress since the last assessment. Their menu is then updated with new recommendations about the activities best suited to their current needs. Configurable email reminders prompt users to re-engage with the program. The Debt Diet generates organization specific usage reports that detail program utilization and provides de-identified summary reports of the readiness of that population to pay down their debt or establish an emergency fund.